Powered by the renowned Realtime Gaming, you can now enjoy full anonynomity while placing your wagers at Diamond Reels Casino. Thanks to their generous bonuses, great selection of games and remarkable VIP Reward Program, we are sure Diamond Reels will be able to persuade many players in the coming years. Diamond Reels Casino is an online gambling operator relying almost exclusively on Realtime Gaming software. The list of excluded countries features the Dutch Antilles, Chile, Denmark, Finland, Japan, Netherlands, Philippines, Poland, Turkey and South Africa. Quite a lengthy one I might say. US players have little to worry about though because their country is not on the blacklist, so they can enjoy their favorite games here. The casino has a page dedicated to responsible gambling and assists those who struggle with any form of gaming addiction. Realtime Gaming is the only software developer powering the entire collection of slots, table games and video pokers. It has the advantage of being very popular among North American players and that’s probably why it was chosen by the casino. While they are specialized in slots belonging to the three and five reel variety, they also offer plenty of choices for table games fans. Blackjack, roulette and baccarat fans probably wish for more choices to play these games against real dealers. As far as slot machine fans are concerned, the assortment of Diamond Reels games is tilted towards this genre. Since they rely upon a single software developer, Realtime Gaming, one shouldn’t be surprised to see that the total number of titles barely surpasses 200. 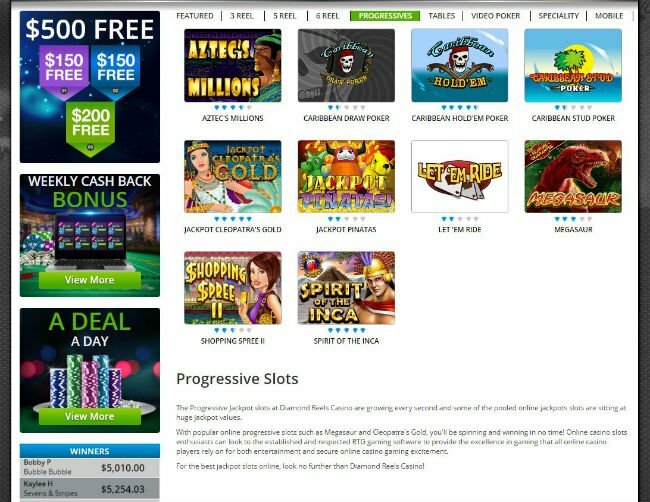 The slots carrying progressive jackpot games are the ones that pay the best and the amounts frequently surpass the threshold of $1 million. Some of the latest additions are present here, including titles that have a unique theme and recognizable characters. Loose Caboose, T-Rex, Triple Twister, and Paydirt are some of the latest Diamond Reels Casino slots that have gained popularity. The same can be said about 7 Stud, Aces & Eights, All American, Deuces Wild, Jacks or Better, Joker Poker, and Loose Deuces, if you prefer video pokers. Baccarat, several Blackjack variants, Caribbean Hold'em and Stud Poker, Let'em Ride, Pai Gow Poker, Red Dog and Tri Card Poker are the table games that are played here more often. Diamond Reels Casino mobile users can consider themselves lucky to be able to run all these games on smartphones and tablets. iOS and Android powered devices can be used for gambling purposes and they touch controls give them a lot of freedom. Players can activate the auto spins, place line bets and use other features to streamline their gaming experience and even push into overdrive. There is still a discrepancy between the number of desktop and mobile friendly games. This is mainly a downloadable casino, so players will have to install the games before they can play on their mobile gadgets. This applies to both regular slots and those carrying progressive jackpots as well as the table games and video pokers. The software is supplied for free by the casino and once downloaded and installed, it will run smoothly on most gadgets. Visually charming and featuring some amazing animations, most of their games get players completely immersed pretty quickly. The registration process is surprisingly fast and that’s the result of little information being requested. In order to be eligible for any of the Diamond Reels Casino bonuses, one would have to make a deposit in the first place. Meanwhile, all existing members can enjoy any of the games they offer on virtual currency, to get familiar with the game mechanics. The only way of making real money without depositing and is by taking advantage of the occasional Diamond Reels Casino free spins. Diamond Reels banking options can feel a bit restrictive at first, as they only include a couple of credit/debit cards and wire transfers. The good news is that players can deposit and wager in Bitcoin as well, which is the perfect choice for those who seek total anonymity. Deposits are performed instantly, while withdrawals take only a couple of days if you use electronic wallets. The downside is that players can only withdraw a maximum amount of $5,000 per week. This can be problematic if you win one of the Diamond Reels Casino jackpots playing progressive slots and want to cash out the entire sum. Customer support is available throughout the day and players can ask for assistance over the phone, email and live chat. There are even toll-free numbers for players from selected countries, not to mention the FAQ section where players can look up the answers themselves. Security is handled by using the state-of-the-art 128 bit SSL encryption technology, to keep sensitive data and funds secured. Their specialists can also provide assistance to those who want to learn more about the use of crypto currency. Once you get in touch with customer support, you can expect an email come your way in less than 24 hours. Players will also discover that they receive a surprisingly high number of promotional material about the Diamond Reels Casino bonuses available. A lot of information regarding their promotions is sent to existing customers, even if they don’t sign up for the newsletter. You can unsubscribe to this information if you want, but you could be missing out on some lucrative deals. The Diamond Reels welcome package consists of €100 and represents the first deposit matched by 150%. In order to collect this amount, players have to use the DR150 bonus code and meet wagering requirements of 30 times the amount. Slot machines count for 100% while video pokers only 10% and many games are excluded. Those who reside in Chile, China, Turkey and Japan are not eligible for the welcome bonus and the subsequent offers. The second and third deposits will result in a Diamond Reels Casino bonus worth an additional €150 but the percentages differ. When you invest for the second time you will receive the same amount as bonus funds, whereas the third investment will result in a bonus of 200% the investment. All the other terms & conditions apply and players have one month to meet the wagering requirements. Players from the aforementioned countries can’t participate in these promotions or bonuses either. The brand's Comp Point Program is at the cornerstone of the loyalty scheme and it rewards one point for every dollar wagered. It is only possible to convert these points into cash when you have accumulated at least 1,000 of them. All the games qualify and they produce the same number of points so you don’t have to make compromises and play games that you don’t necessarily enjoy. The casino also offers a cashback deal that refunds a percentage of the money lost on many games. The amount reimbursed depends on your position in the Diamond Reels Casino scheme, so attaining VIP status is well worth it. The cashback program will refund up to 20% of the money lost by diamond players, whereas regular players will receive a small percentage back. They should check out the list of excluded titles, so they make sure they gamble the cash on the appropriate games. The casino will do its part and calculate the net losses, after subtracting all profits from the amounts wagered. The maximum amount that one can recuperate can’t exceed $100 or currency equivalent. Diamond Reels Casino free spins spice things up and they are offered whenever new games are released. The resulting profits are subject wagering requirements but they can’t be cleared by playing Classic Blackjack, Other Blackjack, Video Poker, Craps, Baccarat, Poker Games, Casino War, Sic bo or roulette. 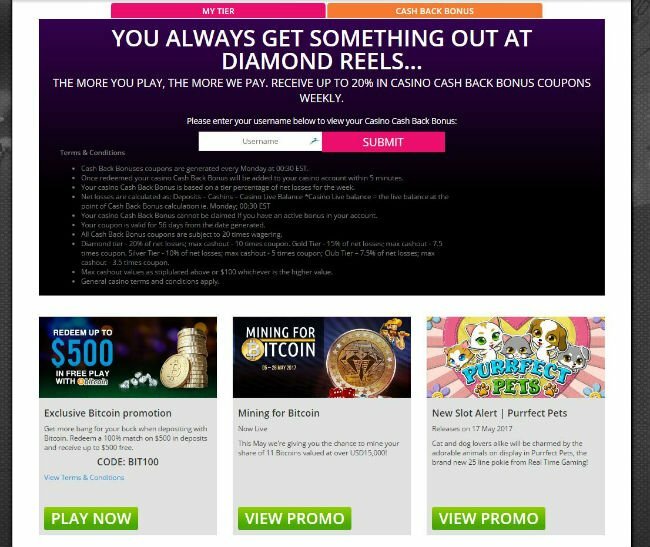 Whenever the casino offers free spins, it will require players to use the appropriate Diamond Reels Casino bonus code. As for the games they can be played on mobile devices in downloadable or instant play. 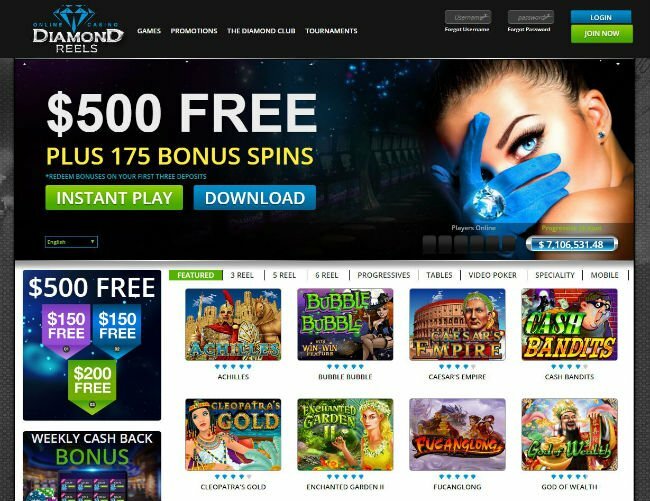 diamondreels.com bonuses are the ones that drive large crowds to this RTG gambling operator. Right from the start, players are pleasantly surprised by their generosity as well as the ease of claiming bonuses of all types. The list of payment methods could use the addition of new financial instruments and the withdrawal limits can definitely be lifted. Those who spin the reels of progressive slots and win Diamond Reels Casino jackpots might have to wait a long time to withdraw their profits. For a relatively new gambling operator, this one shows a lot of promise and has plenty of room to grow. Diamond Reels Casino UK players can find better alternatives on the old continent, but for US gamblers, this is a great place to be. The addition of Bitcoin and the sheer flexibility proven by the casino during the registration process, act as irresistible incentives. It also helps that the casino is mobile friendly, has a nice design and all its games proven fair by independent auditors.